This is the video diary of a novice paddler that kayaked from Vancouver heading for Alaska. It's about 2 1/4 hours longer than I knew a youtube video could be, but it's well worth it if, like me, you enjoy living vicariously through the grand adventures of others. It's an epic video to document an epic trip. I really enjoyed listening to his reflections and tales of his journey. Watch it in HD if you can. p.s. You don't have to watch it all at once! Like practically every other paddler out there, I have a bucket list of places or routes that I really want to paddle. I figured I'd start to write some of them down here. They are in no particular order and I'll probably add to it over time. Some are kayaking destinations, some more suited to canoe. This list could really be much longer, but it's a start. Circumnavigate Lac La Ronge (Sask). On my personal blog I wrote about the idea of kayaking the approximately 290 km of Lac LaRonge a while ago and it's likely to remain on the "to do list" for another year or two. Clearwater River (Sask). Recently, there has been talk about mining the bitumen (tar) sands to the north of the Clearwater, a Canadian Heritage River, and we really should paddle this one while it's still pristine, and to show that there is value in pristine wilderness. Mackay Lake, Bartlett Lake (Sask). I was there a couple of years ago by snowshoe (see Mark's blog post). I'd like to go back by canoe. Not as grand as most other destinations in this list, but the chance of me getting there in the next year or so is rather a lot higher. Coulonge River (Que). My Great Great Great Grandfather was George Bryson, Sr. who was a lumber baron in the Ottawa River Valley. He logged the Coulonge and built the timber slide past the Grand Chutes. Haida Gwaii (BC). The Queen Charlotte Islands and Gwaii Hannas National Park is a place my wife and I would love to paddle. Cree River (Sask). We were hours away from starting this trip when my Grandma died and we pulled out. So, it remains on the list and we are just as eager to paddle it. Belize. A fellow I know has spent a couple of winters teaching kayaking in Belize. Seeing his pictures has caused me to have Belize on my list as a paddling destination. Nahanni River (NWT). Another Canadian Heritage River System river. The Nahanni has been on my list for as long as I've been dreaming about paddling. Lower Sturgeon-Weir (Sask). In 2005 we paddled a section of the upper Sturgeon-Weir from the Hanson Lake Road to Amisk Lake at Denare Beach. We were on Amisk Lake a couple weeks ago (photos and report coming soon?) and visited the river where it leaves the lake in a C2 rapid that looks like a lot of fun. Lake Superior (north shore) (Ont). Bill Mason's films have tempted me to that largest of lakes for 20 years or so. Reading reports by the likes of Bryan Hansel (http://www.paddlinglight.com/) have only added to that desire. South Saskatchewan River (Sask). We've paddled sections of it close to Saskatoon, but I'd like to paddle the rest of the way to The Forks. Given how close it is to home and how often I paddle it, you'd think I'd write about it more, but here is one post from a night paddle in '02, snowshoeing on the river in '09, kayaking on the river last January, and again in March. Newfoundland. Beautiful, scary, rugged, cold, awesome. I don't even know it well enough to say what part I most want to paddle or where to start. But the awe-inspiring coasts of Newfoundland definitely beckon. Lee's writing helps to fuel the awe. Broken Group Islands (BC). We were there in 2010 and I want to go back, explore more and get to the outer islands more. Kazan River (NWT). Another Canadian Heritage River System river. Back in the summer of 1992 I worked at a fishing camp near the headwaters of the Kazan (located on Obre Lake, we worked upriver to Snowbird Lake and downriver to Atzinging Lake). A group of European paddlers came through the fishing camp one day. I've wanted to go back to the Kazan by canoe ever since. One destination that made the list even though I already paddled it, the Broken Group. It will be great to go back by kayak to really explore the outer islands. A Level 3 Sea Kayak Skills course from SKILS is a high priority on my "to do" list and it often runs in the Brokens. 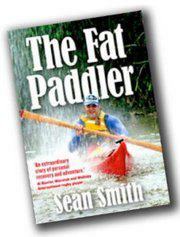 In the video below, Sean Smith, author of the book The Fat Paddler, talks about some of his motivations for creating his blog and for writing the book. I have been an occasional reader of the blog for years and so this book is high on my "to read" list. It has been getting great reviews from around the paddling world (here's one and here's another). In 2012 I had the privilege of paddling with a fellow that is a c5-6 quadriplegic. It was a 2 hour parent + kid class and he was there along with his wife and daughter. I surely learned more that day from that family than they did for me. I look forward to continuing that learning for both of us and hope that we get to paddle together again. He had a kayak that was adapted with a seat and outriggers much like the one that is shown in this video. In addition, he had special connectors that connected his hands (wrists, actually) to the paddle. He mentioned that the new connectors he was using were a great improvement over what he used to do, which was to duct tape his hands to the paddle. The video, featuring a paraplegic paddler and his adapted cedar-strip kayak is very inspiring. Enjoy! Our part of the world is frozen pretty solid right now but I still got out for some paddling recently. Never mind that it was in Florida where their winter temperatures (water and air) were nearly as warm as it ever gets here in the summer. On Thursday I paddled an afternoon in the ocean to have fun and hone my skills, and on Friday our family went on a tour on protected waters to see some Floridian wildlife. I'll cover that tour in a separate post. First, since I don't often get a lot of coastal paddling in and I wanted to work on those skills, I hired Michael Shugg to do an afternoon session of coastal kayak skills with me. Mostly, I wanted to learn to play and tour in surf conditions. Michael is an American Canoe Association instructor from Orlando and he recently started the company Adventure Spirit Kayaking. We started out at a Port Canaveral boat launch, not far from a number of cruise ships, then headed out around the point to the beach at Cape Canaveral/Cocoa Beach. Palm trees and cruise ships at the launch - things you just don't see much of in Saskatchewan. Once out of the port area and clear of the boat traffic, I tried a couple of rolls on both sides to get rid of any rust that might have built up from a couple of months off of the water. We then took advantage of the bit of swell (1.5 feet?) to catch some waves coming in to the beach, working first on coming in slower than the waves and in control, as you would do with a load while touring. That was easy enough so then we spent most of the afternoon working on surfing the waves. On my very first attempt to surf some waves in toward shore I was broached (the following wave pushed my stern sideways until I was parallel to the wave) and I quickly capsized since I hadn't yet learned to lean into the wave. I rolled back up quite nicely so it was great to see my roll working in the real world conditions. A pretty calm day out there but there was some swell, I swear it!